At Die-Verse Tool & Mfg. Co. our name states our philosophy…we are equipped to provide for all of the diverse needs of our customers in a timely manner. In addition to the state of Florida we are proud to serve a customer base hailing from as far west as California to the Northeast region of the United States. 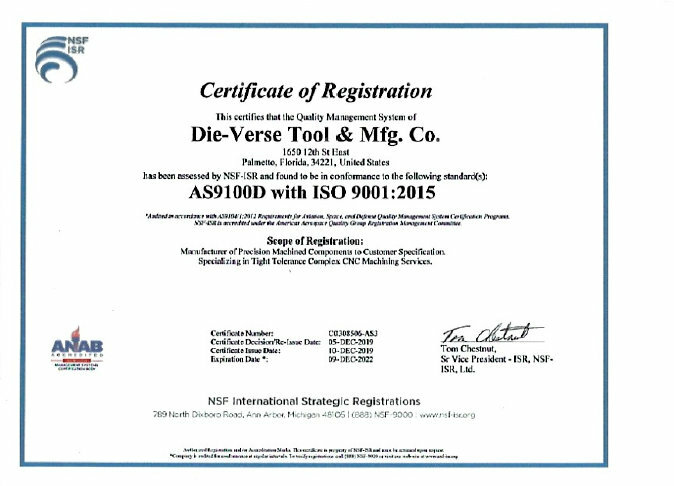 Die-Verse Tool & Mfg. Co. began 26 years ago as a small precision grinding operation in a 4200 sq. ft. facility. Today we are 20 employees strong housed in a new 27,000 sq. ft. building. We are a team that prides itself on precision and rapid turn-around time. Die-Verse Tool has a team with over fifty years of combined experience in our CNC milling department. We offer a full range of milling services including CNC milling capabilities of long or short run production parts and 3D contour milling. Our team offers experience in jig & fixturing, tool & mold making and prototype tooling. In addition to standard milling and tool making we are able to provide services that include prototype tryout of molds for the rubber and plastic industry, build and tryout of stamping dies as well as production runs for plastic molded parts and stampings in our facility. At Die-Verse Tool & Mfg. our primary goal is to ensure that our customers receive a quality product reasonably priced with a timely turn-around time. We are fully equipped to offer services in short and long run production runs of machined components and stamped products. Our team includes State and Federal Certified Toolmakers with expertise in injection, thermal forming and transfer molding, metal stamping carbide and toll steel dies, progressive dies, forming dies and steel rule dies for the packaging industry. Our CAD-CAM capabilities enable us to assist our customers with design and development of custom tooling. We are ready to provide you with a complete project design or assist you with design augmentation including the manufacture of prototype tooling and automation applications. The heart of Die-Verse Tool & Mfg. Co. is a state-of-the-art EDM department including four wire EDM machines. Our EDM department is staffed by a team with over thirty years combined experience. In addition to close tolerance die and mold work we offer production EDM services for any metal or carbide application. We can provide custom form cutters in carbide and high-speed steel used for injection and thermal forming mold applications at a reasonable cost alternative to traditional sinker EDM machining. We have hole-starting capabilities in steel and carbide to as small as (0.015). We are able to offer our customers a rapid turn-around time for the production of emergency die and mold repair sections enabling you to get back up and running on the same day in many cases. From tap removal to tight tolerance production runs our EDM department is fully equipped to handle any of your needs. From one-piece die and mold components to long-run production of close tolerance parts our grinding department can handle your grinding needs. Combined with in-house heat-treating capabilities our grinding department provides support for our tooling department in addition to providing our customers with carbon and copper tungsten electrodes utilizing System 3R fixturing. We value the relationships we have built with our customers and look forward to serving them for many years to come.